While a certain level of corruption goes on in every country, corruption in Kenya is a particularly large problem. The average urban Kenyan has to pay 16 bribes a month to get his regular affairs arranged. This page contains the facts. As a foreign visitor or tourist, you'll see little to nothing of corruption. It's not something to worry about. The following information is simply provided for those who are interested in Kenya, or who run into this subject as a course of their work (students, journalists, development workers, etc.). In the 2008 Corruption Perceptions Index, issued by the anti-corruption organization Transparency International, Kenya ranks 147th out of 180 countries, meaning 146 countries are supposed to be less corrupt than Kenya, and 33 countries are more corrupt. For comparison, the 180th country was Somalia whereas the 1st was Denmark. Though a useful index, this does only measure the perception of corruption in Kenya, rather than the reality of it (as corruption is concealed and hard to measure). Corruption can refer to many different types of illegal acts, though they will usually all involve a person abusing their authority for their own benefit, or for the benefit of family and (political) friends. This can be government officials using public money for their own personal use, or corporate executives improperly awarding contracts or taking other decisions in exchange for bribes. Incidents of corruption in Kenya are not limited to large corporations or government agencies. 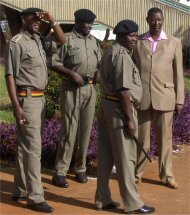 Bribe-taking is common among many lower-level officials, with the average city-dwelling Kenyan having to pay as many as 16 bribes each month just in the course of everyday life. One factor that fuels the problems of corruption in Kenya is tribal loyalty. People in Kenya are first and foremost loyal to their families, then their clan (extended family), then their tribe. Member of the same clan or tribe often ‘help’ each other, even when it involves illegal corruption. Tribal influences have waned over the years, but are still strong. Unfortunately, corruption played a role with all 3 Kenyan presidents up to now. He was the first president of Kenya after independence in 1963. During colonialism, the European colonizers had stolen fertile lands from, among others, the Kalenjin tribe. After the independence (in 1963), Kenyatta did not return those lands to the former owners, but handed it over to members of his own clan and tribe (the Kikuyu). Kenyatta himself became one of the largest private land owners in the country. During Daniel arap Moi's presidency – Kenya’s second president – corruption was widespread and involved Moi himself on many occasions. In the 1990s, he was part of the Goldenberg scandal, where smuggled gold was exported out of Kenya in exchange for high government subsidies. It's one of the largest corruption scandals to date in Kenya, which involved nearly the entire Moi government. Many officials from the Central Bank, and more than 20 senior judges have also been implicated. As of 2008, only a small handful of people been charged with a criminal offense, which some see as an example of the continuing problem of corruption and favoritism. The third president, Mwai Kibaki, was elected in 2002 mainly on the promise to end corruption in Kenya once and for all. Admittedly, there have been quite some improvements in the country (among them press freedom, return of elections and introduction of free and compulsory primary education for all) but corruption had remained a big issue. To start with, his administration consists largely of Kikuyu, while this tribe is only 22 percent of the Kenyan population. From 2003 to 2006, Kibaki’s cabinet spent 14 million dollars on new Mercedes cars for themselves. In late 2008, several members of Kibaki's parliament were found to have taken large "allowances", which were not legally part of their official compensation. And Kibaki has probably falsified the results of the 2007 election, leading to riots. 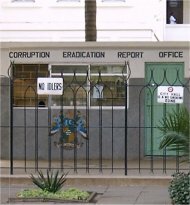 Though legislation against corruption in Kenya has existed since 1956, with the Prevention of Corruption Act, the current anti-corruption agency has only been operating since 2003. Under the Anti-Corruption and Economic Crimes act, the KACC is mandated to fight and prevent corruption though all levels of government and industry. They publish a number of regular reports and newsletters, with the aim of promoting fair business practices and to expose those who engage in questionable operations. How does the Kenyan Government Work?